The Rafale multi-role combat fighter carrying AASM HAMMER missiles. Image courtesy of Dassault Aviation - S. Randé. The AASM HAMMER missile entered into service with the French naval aviation in 2010. Image courtesy of Dassault Aviation - V. Almansa. The AASM weapon system has a range of over 60km at high altitudes. 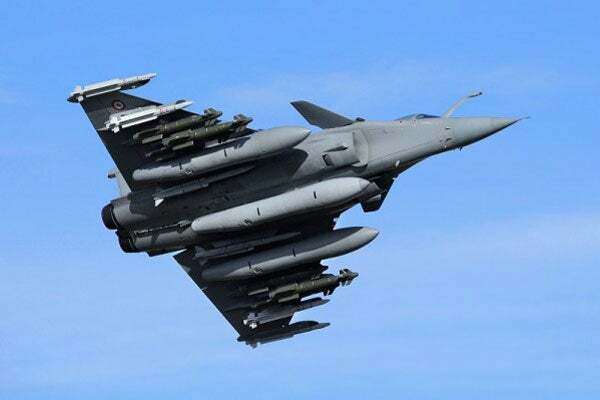 Rafale fighter can carry six AASM weapon systems. Image courtesy of David Monniaux. Armement Air-Sol Modulaire (AASM) HAMMER (Highly Agile Modular Munition Extended Range) is a new generation medium-range modular air-to-ground weapon designed and manufactured by Sagem (Safran group), for the French Air Force and Navy. The AASM family of missiles was unveiled during the Paris Air Show in June 2007. The weapon system was also exhibited during the International Defense Exhibition and Conference (IDEX) held in Abu Dhabi in February 2013. Sagem demonstrated the AASM and missile guidance during the Paris Air Show in June 2013. The AASM Hammer laser missile was exhibited during Defexpo held in New Delhi, India, in February 2014. The standard AASM GPS/inertial version has been deployed onboard Rafale twin-jet, multi-role combat fighters of French Air Force and Navy since 2008 and 2010 respectively. Up to six hammer missiles can be carried by a Rafale fighter. Sagem was selected by the French defence procurement agency, the Délégation Générale pour l’Armement (DGA), for the development and production of the AASM weapon system in 2000. The missile is being marketed by MBDA as part of an agreement signed with Sagem in May 2008. "Sagem secured a long-term order from DGA in December 2009 for the production of 3,400 AASM weapon systems for the French Air Force." Sagem secured a long-term order from DGA in December 2009 for the production of 3,400 AASM weapon systems for the French Air Force. The order includes the development and integration of latest-generation GPS module into the missile. Additionally, Sagem also provides qualification and production engineering for the laser terminal guidance version. The order follows the initial contract secured by Sagem to deliver 750 weapon systems for the French Air Force. The HAMMER missile was also selected by the Royal Moroccan Air Force for its Mirage F1 fighters upgrade programme. The AASM weapon system has a length of 3m and weight of 330kg, and has a range of over 60km at high altitudes and 15km at low altitudes. It has fire and forget capability, and an extended stand-off capacity. The interoperable missile has the ability to engage multiple targets simultaneously. It can also strike fixed or moving targets with high precision. The missile is maintenance-free and has low lifecycle costs. The missile uses single, double or triple store adaptors and uses Sagem’s Hemispheric Resonating Gyro, inertial / GPS hybridisation and strap-down infrared imagers and associated algorithms for conventional deep strike missions. The AASM HAMMER missile consists of a guidance kit and a range extension kit. The kits are fitted with Mk82 warheads including Smart Bomb Unit (SBU)-38, SBU-64 and SBU-54. The easy to use missile supports operations with 125kg, 250kg, 500kg and 1,000kg bomb bodies, and can be reprogrammed during the flight. The basic version SBU-38 HAMMER is provided with hybrid INS/GPS guidance, while the SBU-54 version is equipped with INS/GPS/IR (infrared) guidance. The latest version SBU-64 uses INS/GPS/laser guidance. The laser terminal guidance version can be deployed to engage moving targets, while the infrared terminal guidance version minimises target coordinate errors. The combat proven missile can operate in all weather conditions during the day and night. It has vertical strike capability and can support deep strikes, close air support, air interdiction, and SEAD-type or anti-ship combat missions. The propulsion system is fitted at the rear of the missile and consists of a solid rocket motor and four winglets for flight control. The French DGA completed first operational test firing of the SBU-38 GPS / inertial guidance version by a Mirage 2000N at the authority’s Biscarosse Launch Missile Test Center in December 2006. The first test firing of AASM weapon system by the French Air Force’s Rafale fighter took place in April 2007. The French Navy’s Rafale successfully test fired the first AASM in April 2007 and the second test firing was conducted in June 2007. DGA carried out first test firing of the infrared terminal guidance version by a Mirage 2000N in August 2007. The missile was test fired with an infrared homing device from a Mirage 2000 fighter and completed the industrial validation in February 2008. DGA completed the second qualification firing test of the infrared terminal guidance version of the AASM at its missile test range in Biscarosse in June 2008. The third and final qualification test firing of the AASM infrared terminal guidance version was conducted at the DGA’s missile test range in Biscarosse in July 2008. Sagem and DGA completed first test firing of the 125kg missile with inertial/GPS guidance from a Mirage 2000N in January 2009. A 250kg HAMMER with laser terminal guidance in a demonstrator version was first test fired in June 2010. In December 2010, the 250kg AASM with infrared terminal guidance was successfully launched by a Rafale multi-role fighter during night at the DGA’s missile test centre in Biscarosse. The AASM system was launched during a demonstration firing test by a Rafale fighter against a land target moving at high speed, at the missile test range in Biscarosse in April 2011. The French Air Force and Naval aviation commenced operational deployment of the infrared terminal guidance version in October 2011. The DGA conducted first qualification firing test of the laser terminal guidance version by a production Rafale fighter in May 2012. The last qualification firing test of the laser terminal guidance version was completed in December 2012. The SBU-54 missile was officially qualified in June 2013. The AASM-1000 which features airburst and data link is under development. "The AASM HAMMER missiles were successfully tested on the Rafale fighter of heavily-armed configuration in January 2014." The AASM HAMMER missiles were successfully tested on the Rafale fighter of heavily-armed configuration in January 2014.